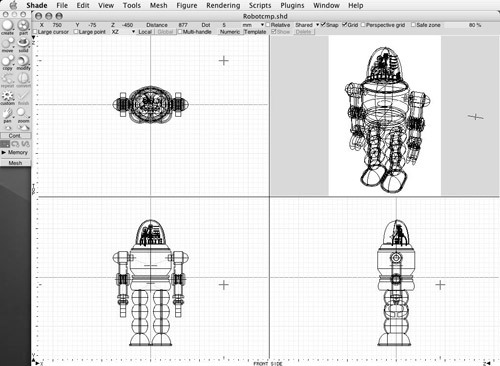 e frontier (yes, they are diminutive) in Scotts Valley CA makes Shade 8, a 3D modeling program. That is, it creates software models in three virtual dimensions. Presumably, according to the literature, anything you can imagine or visualize can be modeled in the program. 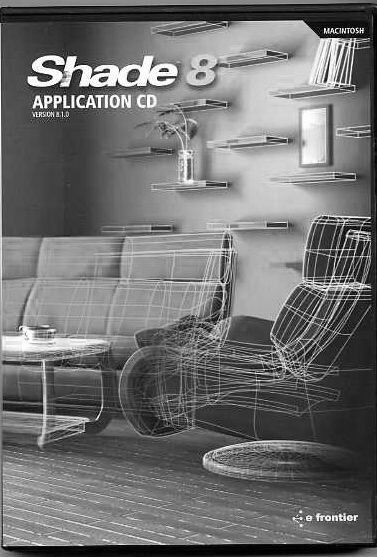 3D modeling is not new to me. I have done considerable modeling in Ray Dream Studio 5 on my old Power Mac 8600. So, why did I get a new program when I had an old one? The answer is the ballerina’s tutu! My animation program Poser 5 (Poser 6 is out!) has the ability to “clothify” objects to make them behave like fabric that can flow and drape. When I created tutus in Ray Dream (I will not repeat that I modeled the tutu! ), they would not clothify in Poser. I found that the reason was that Ray Dream could not create enough “polygons,” the elemental part of the model. Too few polygons and the material will not drape or flow. Poser has some props that I could clothify. They appeared to have hundreds more polygons than I could get in Ray Dream. Shade 8 allows the number of polygons in a model to be increased arbitrarily. One of the little problems in going through the tutorial is following a long instruction. If the Shade four-view window is displayed full size, the tutorial instruction is hidden. It must be memorized to implement. Otherwise, the Shade window size must be reduced in order to see the instructions. The solution, of course, was to reduce the size of the four-view window so the tutorial could be viewed simultaneously. 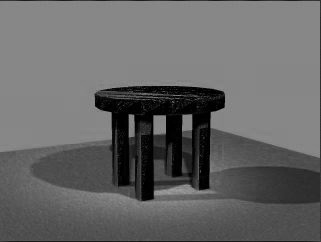 Well, eventually, I modeled (created) my first object: a table, Fig. 3. It is merely a disk, extruded, a small rectangle extruded (leg) which is copied and moved three times. I imported the table into Poser, gave it color, texture, and fancy lighting, and rendered (colored) it. In iPhoto I converted it to B&W for this review. Note: The model can also be rendered in Shade. Page 69 in the tutorial begins with the creation of a glass vase and a flower to put in it. It’s another big ball of wax, so I’m terminating the review before I start that. Overall, I am happy with the program. Glancing through the rest of the tutorial and into the User Guide, I can see that this program has myriad possibilities. The Shade 8 installation is 923.4 MB. On the install disk there is a program called ShadeGrid. This allows more than one computer at a time to run the rendering (creating graphics in color) of a graphics job to speed up the process. This is the way Hollywood does it!